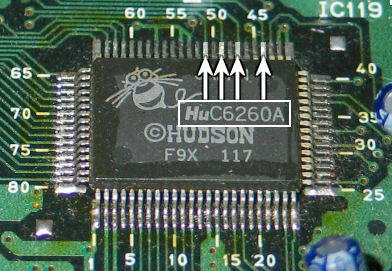 The Hudson-made video chip inside the PC Engine only outputs two video formats: composite video, and RGB. Happily, RGB is the stuff from which all other formats are born. Once your RGB is tapped it can be easily converted to Component or S-video, giving stunning output far superior to what the PC Engine natively offers. There are several caveats, of course. The biggest is the quality of the RGB output - it's not very bright, and will result in an image without much contrast, so you will probably need to add an amplifier. Even on monitors that display a very good image without the amp you'll sometimes find the sync signal needs an amp to generate a stable image. The amp details shown below cover both the RGB and Sync outputs. The other caveat: this will require open-console surgery. Regardless of the model (PC Engine, TurboGrafx, Vistar) you're going to have to open the console and do some soldering. The good news is the RGB can be tapped from either the video chip itself, or the expansion bus, so these mods will work on any and all PC Engine or TurboGrafx system. This includes the white PCE, the Core and SuperGrafx units, the GT, LT, PC Shuttle, LaserActive, the PAL TG-16, the Korean Vistar, everything! Well, maybe not the clones. If you're modifying a unit without an expansion connector you'll need to attach wires directly to the video chip. There's no need to lift them from the PCB, just attach your wires directly to the legs as shown below. The first thing to do is locate chip Hu6260. The pins are marked on the PCB at the corners, with lines every five pins. Shown below is a Duo R. All the PC Engines have this chip, if you don't see it, look harder. On the original Duo it may be under the PCB. 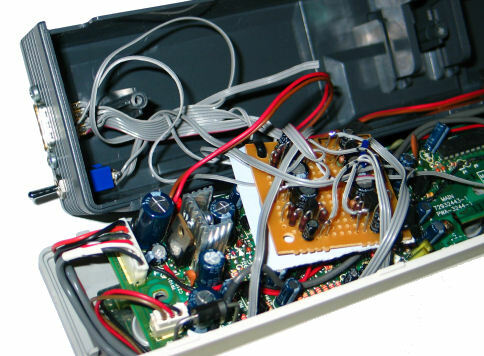 Composite Video and Ground can be tapped from the AV port. Use caution when attaching wires to the chips, if you over-stress the legs you can break them off and then there's no RGB for anybody. You won't ruin the system if you break them though, these RGB signals aren't normally used. This is easier than the other method, but obviously won't work on some models. There's another advantage to this method: you can use it on the peripheral, instead of the system, and modify (for example) the CD ROM2 instead of the console, so any base unit plugged in will benefit. I've put this into CD Systems and even a Tennokoe 2. This image shows a CD System, but the pinout is the same for all PC Engine and TurboGrafx peripherals. 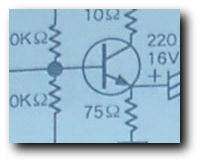 You don't have to draw the +5v or Ground from here, but it's convenient. 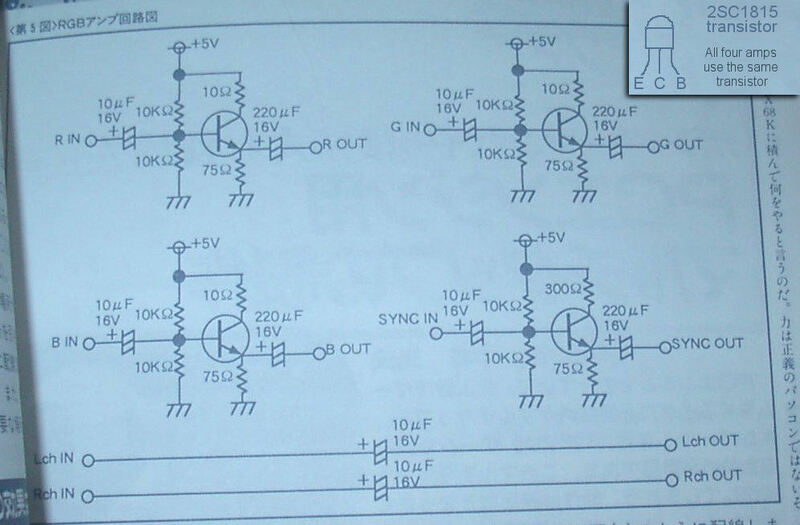 Remember that this image shows the peripheral, be careful to flip the connections if you're working on the system itself. There are a lot of ways to get this new RGB output to the outside world. While I'd normally recommend my custom AV connector the shape of the DB9 makes it difficult to make nice clean holes - this Duo-R mod got a little messy. When working with PC Engines you might consider using a DIN-8 connector, which has the advantage of being round (so you can use a drill to make a simple, clean hole) and allows you to maintain compatibility with normal PC Engine AV connector. 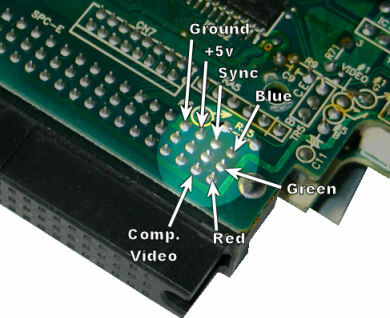 The bottom five pins on the PCE's DIN5 and the DIN8 are the same. This allows you, on the systems that support it (Core Grafx, SuperGrafx, SuperCDROM, Duo, PCE Shuttle) to replace the existing 5-pin DIN with an 8-pin DIN, without any externally visible changes. The disadvantage though is that you can't have both composite video and composite sync if you plan to run stereo sound, +5v, GND and RGB as well. You run out of pins, and a switch would be required. Even though the DB9 has enough pins I used a switch anyway to maintain compatability with my custom AV pinout. If you can get the parts and have the ability to assemble this amp, you won't regret it. For most monitors it's not necessary, though as mentioned above some won't sync without it. If you use an upscan convertor like the XRGB-2 you'll have a very acceptable image without the amp. 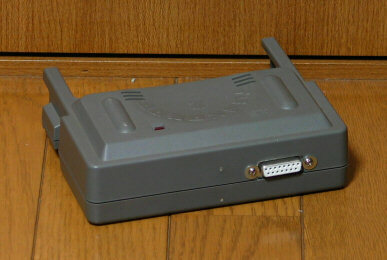 This amp (taken from PC Engine , a 1988 Japanese book) is quite small and will fit inside nearly every PC Engine system. You might have trouble with the GT and LT, but the rest are very spacious inside. As you can see it fits easily inside the CD ROM interface unit with plenty of room to spare. 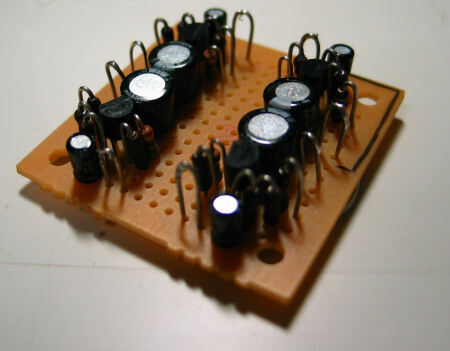 Bonus Tips!Finding Ground: As a general rule of thumb, any large blobs of solder holding something down will be connected to a very large metal trace running around the board, and you can use this as a grounding point. When in doubt, look at the screws. They're always connected to ground. Boiler Plate All contents ©1997-2004 Game Station X unless otherwise noted. All trademarks copyright of their respective companies. Game Station X assumes absolutely no responsiblility whatsoever for any sort of damages incurred while either viewing this information or doing anything with said information. If you don't like it, change the channel. Some of this information may have come from other sources, and Game Station X in no way implies ownership of this information, and merely intends to provide a convenient source for finding this information. That said, we wrote this, and would appreciate your not lifting it for your own page without due credit. Mail us!